My son has got an International Day at school next week. Some weeks ago, I, not thinking at all, volunteered to contribute to the German stall with two kinds of German cookies. What was I thinking? Have I gone crazy? Being more able to oversee my schedule of the next week, I realize that I will have no time whatsoever to bake not even one batch of any cookies. Instead of baking I will be busy running half marathons, going to see the Dubai Tennis Championships, planning, celebrating and surviving my daughter’s birthday incl. kids party, perhaps a chocolate themed baking session with fellow Dubai food bloggers, cleaning the house thoroughly as I will be having my grandparents from Germany here to visit…. I am telling this a neighbor this afternoon as I am close to falling into depression about this. – Hang on, she says, your grandparents are coming from Germany? Can’t they bring German cookies? – YES, YES, YES, they can. What a brilliant idea!!! – Which airline are they coming with? If they come with Emirates Airlines they will be allowed 30kgs luggage each. – Enough space for German cookies to feed a whole school with!! Off I go to ask my grandparents this huge favor, and my 85-year old granddad is raiding all supermarkets and grocery stores as we speak. Apparently, several kilos of cookies have been purchased already. My grandparents seem to be more than happy to help me out with this. Big sigh of relief. Life is good again. The store-bought cookies won’t be as healthy as my homemade ones, but International Day is not the day I need to convert the school to healthier eating habits. Will try that some other time. 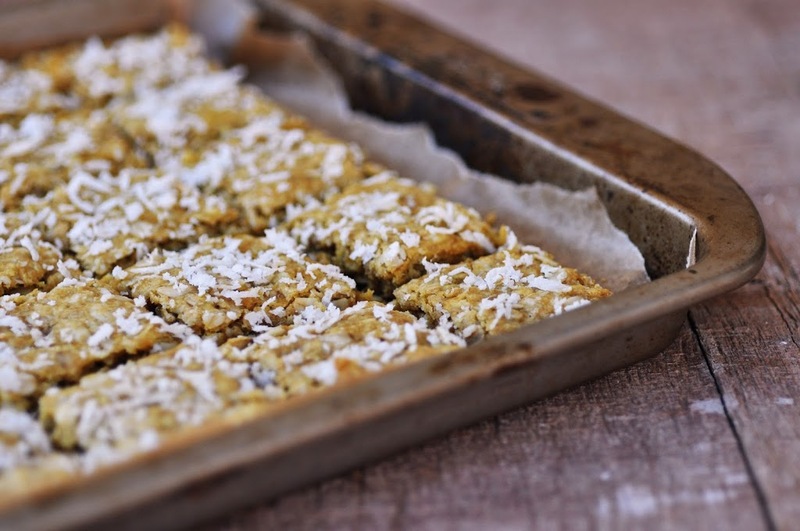 Meanwhile, my poor family will be deprived of any cookies for the next few days and will be left with what’s left of these amazing Coconut Almond Oat Crunchies. They are something between a cake and a cookie, but most importantly crunchy. An amazing combination of coconut, almonds and oat in handy little square shapes makes me raid the cookie tin very often. My current favorite cookie!!! In a large bowl, combine flour, oats, coconut, almonds and palm sugar. Set aside. Melt the butter. Take off the heat and stir in maple syrup. Set aside. In a small bowl or cup combine baking soda with boiling water, then add to the butter mixture. Mix wet ingredients with dry ingredients until well combined. Press the batter into the baking sheet, about 1/2 inch thick. Sprinkle with grated coconut. Bake for 15-20 minutes, or until lightly brown. Remove from the oven and cut into squares. Return crunchies into the switched-off oven, and let them dry out for another 10 minutes. Remove from the tin, once they are cooled completely.